Posted October 25, 2018 by Jack Stickney & filed under Meet The Locals. With a lifetime love affair with the ocean, artist James Robinson (Dolsen) showcases his unique style of artwork and woodworking. Handmade wooden surfboards & paddles inspired by the traditional Hawaiian surf craft known as Paipo’s & Alaia’s adorned with illustrative detailed artwork burnt into the fibres of the wood in a hand drawn process called “Pyrography”. In order to create his pieces Robinson carefully selects each hand cut slab (or blank) from a sustainable sourced Byron Bay wood plantation. Each slab must then be shaped and reformed into a piece of artwork with the grains on each piece becoming a one of kind piece featuring it’s own individual accents. 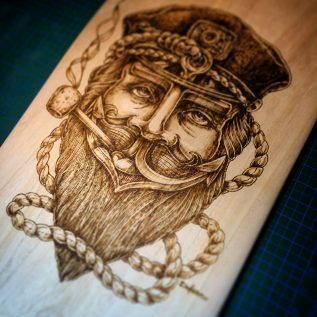 Robinson will be hosting an introduction to pyrography workshop at hypmotive hub on Nov 3.